This is a photo of one of the beautiful paintings done by one of my student's at my last Adventures in Acrylic class at Port Moody Arts Centre. For my acrylic classes, I use only professional grade supplies (Golden, Liquitex etc.) and teach students the techniques they will need to confidently create their own paintings both during the classes and once they get home and are on their own. I cover color theory in every class so that, by repetition and example, by the end of the classes students can feel confident about which color to choose for the effect they are trying to achieve. During the classes we will create anywhere from 2-6 paintings depending on the complexity of the projects as I vary the projects for each session. My goal is to help artists learn how to see and think as an artist and provide the tools they need so that they can create a process that works for them and their style so that they can consistently grow as an artist. 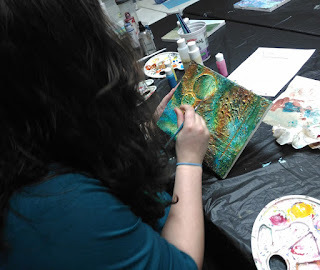 The class runs on Thursday night from 7-9pm starting March 10 and you can register athttp://register.asapconnected.com/ClassDetail.aspx?pk=500451 or if you prefer, you can call 604-931-2008 to register over the phone.